The PERS UAL Task Force offered options Wednesday that could pay down the public pension system’s debt by $4.2 billion to $6.4 billion, as well as additional options that could not be quantified. Gov. Kate Brown appointed the task force to look for ways Oregon could pay down the Public Employees Retirement System’s $25.3 billion unfunded actuarial liability by up to $5 billion over the next five years. Paying down PERS debt would slow the growth of employer rates. The task force began meeting in July and was charged with looking at state assets, one-time funds and encouragements for public employers to buy down their individual liability. The report identified the most significant opportunities that “were not unreasonable public policy.” Options ranged from harvesting one-time “windfall” incomes to reducing agency reserve funds, with notes on pros and cons. In announcing the report, Brown has already expressed reservations about two ideas: privatizing public universities and selling SAIF, Oregon’s state-chartered workers’ compensation insurance company. Jim Green, OSBA executive director, said the report offered a good first step toward resolving the PERS puzzle and he is thankful the governor recognizes that the issue has to be addressed. OSBA is looking for a broader solution, he said. Milliman Inc., the actuarial firm hired by Oregon, estimated in September that school districts will owe $530 million more for 2019-21 than they paid this biennium, a 6.48 percent increase. A little more than 20 percent of school districts’ payroll costs will be going to PERS, up from 13.9 percent this biennium. The PERS board will release the preliminary rates for 2019-21 individual employers on Dec. 1. The official rates will be set in September 2018. For 2017-19, districts’ PERS cost increased $335 million. Districts will pay $935 million into PERS, more than 11 percent of the $8.2 billion State School Fund. Green also said that a report recommendation that schools be compelled to use funds from the so-called “May correction” to pay down PERS liabilities would further drain already strapped school budgets. Such funds have typically been used to account for school enrollment growth from year to year. Each task force member explored a different area of Oregon’s potential assets. Charles Wilhoite, managing director of Willamette Management Associates, looked at school surplus funds and unused properties. After meeting with school business officials and administrators, he told the task force there was no money to be found there. Wilhoite concluded that the best option for schools’ debt would be some sort of incentive system to encourage schools to pay down their PERS debt through side accounts. 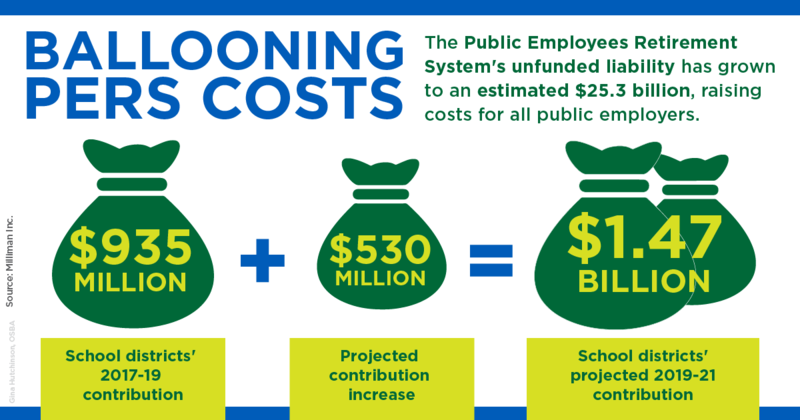 The report suggests a $500 million to $1 billion state incentive fund offering a 25 percent match could create up to $4 billion in PERS reductions. “It’s difficult, but it doesn’t do us any good to postpone it any longer,” Wilhoite said.